June 24th in WordPress Themes by Wordpress Jedi . Question-and-answer websites have been around for a long time. I have personally learned a lot from studying Quora questions and answers and contributing to that community once in a while. You don’t have to rely on Quora or Yahoo! answers all the time though. In fact, many businesses may benefit from hosting their own Q&A community. QAEngine happens to be an elegant theme that turns your website into a Q&A portal. QAEngine has a responsive and clean design. It offers a full-width layout design and gives you a lot of control over your content. The theme keeps your content quite readable and encourages your community members to contribute to your website. In fact, asking and answering questions couldn’t be any easier. The back-end options panel is pretty easy to use too. You get control over branding, mail template, language, and general site settings. You can see all users and manage them from the back-end. 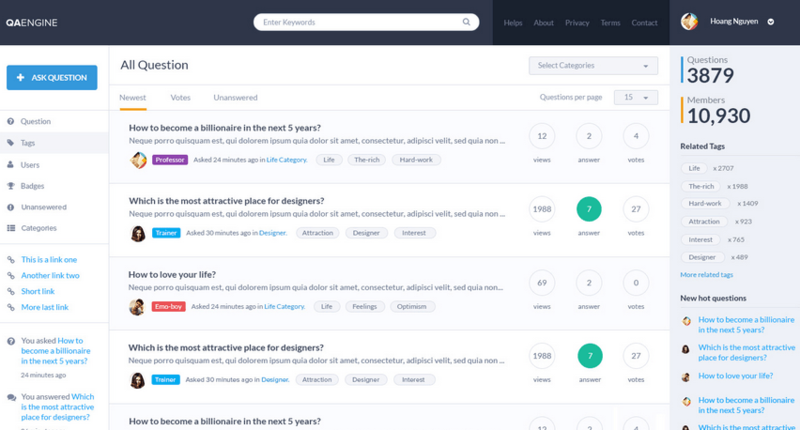 Want to search for users? No problem. The theme does have an achievement system, so you can give points to folks for creating questions, answering them, and providing best answer. QAEngine relies on tags and categories to keep your content organized. As you can see in the above screenshots, you can add videos, pictures, and all kinds of content to your posts. As far as community building goes, QAEngine has a lot of fun features. The design is clean and very readable. The points system encourages your visitors to get involved. We would love to see live search and ad serving added to this theme. The folks behind it are known for their great support and powerful theme extensions, so the future looks bright for this theme.